My article for New Scientist about the discovery of more-abundant-than-expected lunar water finally reached the newsstands last week. I’d like to welcome any readers of that article who have come to this blog looking for more information. This article had quite a long gestation period. I first pitched the idea of an article about the LCROSS mission to my editor about a year and a half ago, but at the time she didn’t really see the news value of the story. Before the LCROSS mission lifted off, there wasn’t a whole lot of excitement about it in the media. But then a lot of things changed. 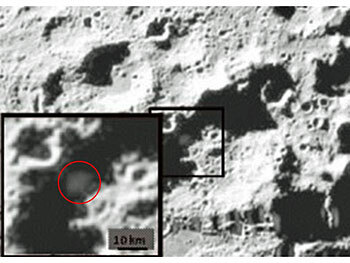 The Chandrayaan-1 discovery of surface water on the moon. David Letterman’s skit that poked fun at the idea of “bombing the moon.” The very successful impact that dug up a lot of water, plus other volatile compounds. At the same time, a big policy debate was going on about our future in space, with the Augustine Commission issuing its report about the same time as LCROSS was hitting its target. That debate culminated in February, when President Obama recommended the cancellation of the Constellation Program and redirected NASA’s priorities for the next decade. With all of these things going on, I think it is fair to say that the moon and lunar water was one of the top stories in solar system science over the last few months. I wrote the first draft of the New Scientist article in December, following the Lunar Exploration Analysis Group meeting in Houston (November) and the American Geophysical Union meeting in San Francisco (December). I really wanted the article to come out then, when it could still (maybe, in some far-fetched scenario) have had some effect on the policy debate. However, the article got delayed until April, not for any political reasons but just because New Scientist feature articles get put into a queue and it takes some time for them to work their way through that queue. Meanwhile, the Obama decision happened and so I had to revise the article to reflect that reality. In the end, I failed in my original goal of writing an article that would perhaps have an influence on the future. However, I do think that the article itself came out a little bit stronger as a result of the delay. I was able to replace some of the “ifs” and “possibly”s and “could be”s with more definite statements. In some sense it became a retrospective on the lunar water story of 2009, rather than a story-in-progress as I originally conceived it. However, I would like to emphasize that there is still a story in progress, as the LCROSS data and LRO data continue to come in and become better understood. My last two posts were about the American Geophysical Union meeting, held this week in San Francisco. The meeting is now over, but I’m not done writing about it yet — not by a long shot! In 1971, Nick Drake recorded a song called “Pink Moon” that became a posthumous hit in 1999 when it appeared in a Volkswagen commercial. Now it turns out that he was really on to something. On Wednesday afternoon, Carle Pieters, the lead scientist for the Moon Mineralogy Mapper on Chandrayaan-1, the Indian spacecraft that circled the moon for ten months, talked about her discovery of a new, magnesium-rich pink spinel. Well, okay, it isn’t really a pink moon. But if you go to the moon’s far side and land your spacecraft on the edge of the Moscoviense basin — a very attractive place, with one of the few maria on the moon’s far side — she says that you can dig up all the pink spinel that you want. Because we have never landed anything on the moon’s far side — human, robot, or other — we’ll have to wait a while to find out if she is right. 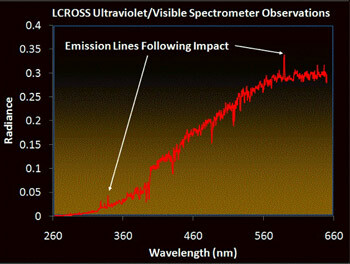 The evidence from the Moon Mineralogy Mapper (M-cubed for short) is a very distinctive spectrum, with no absorption at 1 micron and a “whopping” (Pieters’ technical term) absorption band at 2 microns, that is totally unlike any other known moon rocks but a very good match for pink spinel measured in the laboratory. Neither Pieters’ nor Sunshine’s findings are going to make headlines, but they are good examples of a scientific instrument doing what it was meant to do, and finding new stuff. The take-home message for non-geologists is just that the moon is not a homogeneous place; it has stuff we haven’t seen before and it most likely has stuff we haven’t even thought of yet. The other message is that all of these discoveries allow us to piece together a few more puzzle pieces to understand lunar geology. This comment made me sit up in surprise. I tend to think of the magma ocean as a done deal; I wrote about it in my book as one of the major discoveries, perhaps the major discovery, of the Apollo missions. Why would you care about proving something you already know? The reason is that in science, nothing is ever really a done deal. A hypothesis may eventually become a theory, and it may become conventional wisdom, but you always want to collect new data and look for new evidence. The magma ocean hypothesis is based on a few anorthositic dust samples and anorthositic rocks collected by the Apollo astronauts. Until now, we hadn’t really seen any large-scale structures made of anorthosite. Now we have seen a whole mountain range of the stuff, or at least Pieters thinks we have, from orbit. The next thing to do is send a geologist there and see if she is right. Do we have any volunteers to go and look for Carle Pieters’s white mountain range? At the American Geophysical Union meeting this week I dicovered that I belong to a small community that I didn’t even know about: I’m a geoblogger! There was a luncheon on Wednesday for people who blog about earth or space sciences, and so I got to meet about fifteen other people who do the same thing. One of the things that struck me was the diversity of the blogs: the different types of sites, the different reasons for blogging, the different people doing it. Every blog has its own flavor. The majority of the geobloggers were graduate students or faculty, but there were a few journalists too. So who was there, you ask? Let me introduce you! Reia Chmielowski came from the longest distance — all the way from Milano. She is a postdoc in metamorphic petrology. Her blog, The Musings of a Life-Long Scholar, takes a personal tone, and it might be of interest to academics outside of geology. Larry O’Hanlon is a professional journalist who will be blogging for “two more weeks” at Discovery News before passing the blog on to someone else; however, he will still remain very much involved with the site. He notes that it’s kind of hard to tell the blog apart from the regular news now, because a recent redesign of the site has merged the two. Claus Haslauer, Dave Petley, Pawam Gupta, and Steve Easterbrook had different approaches to the faculty blog. They are your go-to guys if you are interested in geostatistics, landslides, aerosols, and climate change informatics respectively. To a large extent their blogs are oriented toward colleagues rather than to the public. (Gupta said this explicitly — the purpose of his blog is to “review peer-reviewed papers.”) However, Petley’s blog in particular gets a lot of hits from outside academia, especially when a natural disaster hits. He also says that he attracts a lot of students with his blog, and has begun to be better known for his blog than for his own research! Faculty everywhere, take note! Actually, this last comment raises an interesting point. Julian says that people always ask him how he can study something as depressing as earthquakes, but in fact earthquakes give us lots of fascinating information about our planet. Like carnivores with big claws and big sharp teeth, they get a bad rap. To read more about them, check out his blog, Harmonic Tremors. If there was one blog whose title made me immediately want to go read it, it was probably Brian Shiro’s. He is currently in training to become an astronaut. By some quirk of fate, he learned about an opportunity to apply for astronaut training the very same week he started his blog, Astronaut for Hire. That’s right, he started his blog first and then became an “astronaut for hire”! This is a true example of the power of positive thinking. By the way, his “geo” credentials are that he works at the Pacific Tsunami Warning Center, and his blog contains some posts about that topic as well. There were two interesting blogs from people who, like me, are academic castaways. Andrew Alden is a former geologist with the US Geological Survey who now is the Geology Guide for about.com. He uses his blog as a front end to his main informational pages on about.com, which get the most traffic. He noted that when he started with about.com, he would write long informative posts, but he has since found that about 80 percent of the people who visit the site just want to look at pictures of rocks! I hope that Michael Tobis doesn’t mind me describing him as an “academic castaway” because he is in fact employed at the University of Texas, but it sounds as if his job is not really his raison d’etre. “My blog has been the core of my intellectual and social life for the last two years,” he said. His passion is climate change and his blog is called Only In It for the Gold, and you need to check it out. Finally, three representatives of mainstream publications were also there. Carolyn Gramling blogs for www.earthmagazine.org, Mouse Reusch is one of several writers for the Big Wide World graduate student blog at www.newscientist.com, and Harvey Leifert is a rather infrequent blogger at the Climate Feedback blog at www.nature.com. We forgive Harvey because he is the former public information officer for the American Geophysical Union and thus has done more to promote public understanding of geophysics than all the rest of us put together. I apologize to any other bloggers who were there whom I haven’t written about, because I had to duck out of the lunch early (actually, at its scheduled ending time) to hear the great debate over the Younger Dryas Boundary. The question: Did an impact from an extraterrestrial object cause the climate cooling 12,900 years ago that maybe caused sabertooth tigers to die out and the Clovis culture to end? To me, the most convincing talk by far was given by Alan Harris of the Space Science Institute. The intrinsic probability of such an event, a 4-kilometer asteroid hitting Earth in the last 13,000 years, is so low that you need extremely compelling proof to overcome it. As a mathematician, I would use Bayes’ Theorem to explain this, but there is an old saying of Carl Sagan that works just as well for non-mathematical folks: “Extraordinary claims require extraordinary evidence.” And the evidence for the alleged impact, so far, falls way way short of being extraordinary. Well, none of this has much to do with the moon, but it’s just an example of the incredible variety of interesting stuff you can hear about at the AGU meeting. Sometimes the best questions are facetious. Before I tell you the answer, let me tell you why the question is not as crazy as it seems. Kasper had just reported on the most unexpected finding so far by the cosmic ray experiment. It was supposed to measure how much radiation on the moon is coming from outer space (cosmic rays) and the sun (mostly protons from the solar wind). But they have found that the moon itself is a significant source of radiation. In open space, CRaTER counted about 33 cosmic rays per second. (By the way, that’s an unusually high number. The sun is currently in one of the most quiet phases ever recorded in its magnetic cycle, which means that it is not doing as good a job as usual of blocking cosmic rays from outside the solar system.) When LRO got into lunar orbit, about 50 kilometers above the surface, the count dropped to 22 cosmic rays per second. Sounds great — you’re safer on the moon than in outer space. But here’s the catch. If you’re on the moon, the moon ought to block half the cosmic rays coming from outer space! Even if you’re orbiting 50 kilometers above the moon, the moon should still block about 14 out of 33 cosmic rays, letting only 19 through. Because CRaTER is recording 22 per second, the remainder of the radiation (3 events per second) must be coming from the moon! At this point, they can’t be sure why, but Kasper conjectured that this radiation is produced by cosmic rays that hit the surface, smash up an atomic nucleus, and re-radiate back into space. What does this have to do with space suits? Well, your space suit contains lots of heavy atomic nuclei for the cosmic rays to smash into. So if you’re an astronaut, you’re going to be exposed to some radiation emanating from your space suit, for the same reason. That’s why Robinson asked his question. Now really we don’t recommend future astronauts to do the full moon-ty. There are good reasons for wearing a space suit, such as the inconvenient fact that humans need air to breathe. However, Kasper did say that we should think carefully about what we make space suits out of. Are some materials better at absorbing cosmic rays than others? It’s also relevant for building shelters on the moon. “The results suggest that building a wall is a little more helpful than building an umbrella,” he said.